Let’s break it down by year. 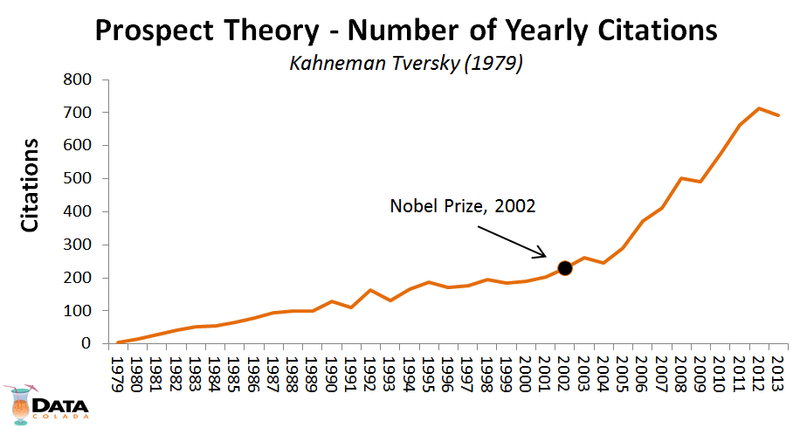 To be clear, this figure shows that just in 2013, Prospect Theory got about 700 citations. Kahneman won the Nobel prize in Economics in 2002. This figure suggests a Nobel bump in citations. To examine whether the Nobel bump is real, I got citation data for other papers. I will get to that in about 20 seconds. Let’s not abandon Prospect Theory just yet. Below we see which researchers and which journals have cited Prospect Theory the most. Leading the way is the late Duncan Luce with his 38 cites. If you are wondering, Kahneman would be ranked 14th with 24 cites, and Tversky 15th with 23. Richard Thaler comes in 33rd place with 16, and DanAriely in 58th with 12. The first article to cite Prospect Theory came out the same year, 1979, in Economics Letters (.pdf). It provided a rational explanation for risk attitudes differing for gains and losses. The story is perfect if one is willing to make ad-hoc assumptions about the irreversibility of decisions and if one is also willing to ignore the fact that Prospect Theory involves small stakes decisions. Old school. Correction: an earlier version of this post indicated the Journal of Political Economy did not cite Prospect Theory until 2005, in fact it was cited already in 1987 (.html). 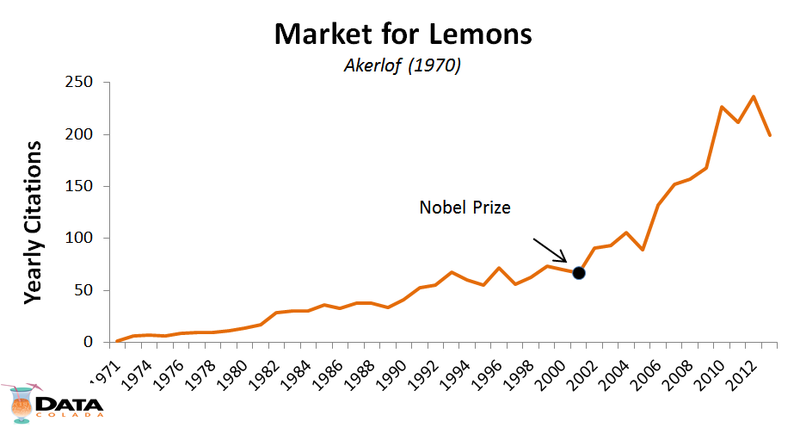 The first figure in this blog suggests the Nobel lead to more Prospect Theory cites. I thought I would look at other 1979 Econometrica papers as a “placebo” comparison. It turned out that they also showed a marked and sustained increase in the early 2000s. Hm? I then realized that Heckman’s famous “Sample Selection as Specification Error” paper was also published in Econometrica in 1979 (good year!) and Heckman, it turns out, got the Nobel in 2000, my placebo was no good. Whether the bump was real or spurious it was expected to show the same pattern. So I used Econometrica 1980. 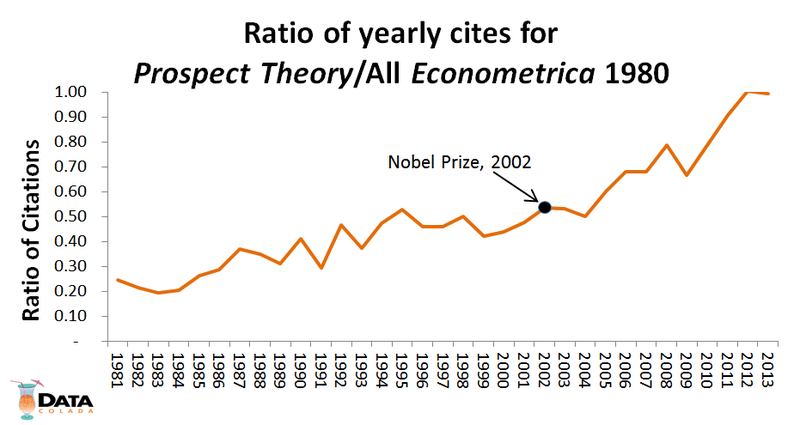 The figure below shows that deflating Prospect Theory cites by cites of all articles published in Econometrica in 1980, the same Nobel bump pattern emerges. 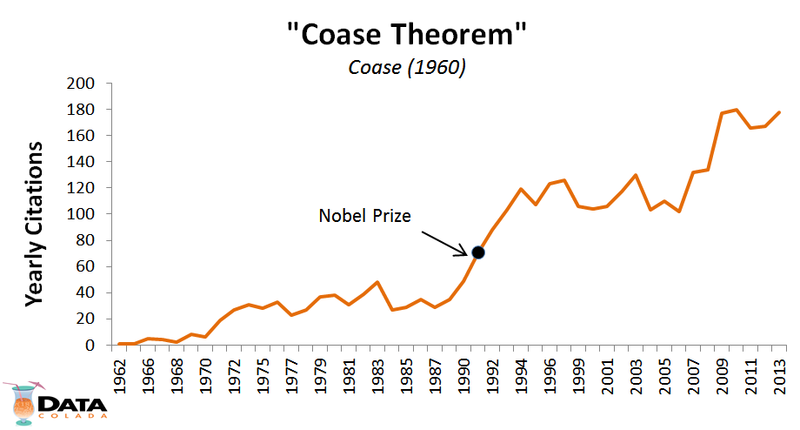 Before the Nobel, Prospect Theory was getting about 40% as many cites per year as all 1980 Econometrica articles combined. Since then that has been rising, in 2013 they were nearly tied. Let’s take this out of sample, did other econ Nobel laureates get a bump in citations? I looked for laureates from different time periods and whose award I thought could be tied to a specific paper.